Gary Lucas will be presenting another of his Don Van Vliet tribute shows on Monday 22nd January 2018, 8pm at the City Winery, New York City. The performance will follow a similar format to previous events hosted by Gary and will feature screenings of rare video clips of Beefheart, projections of Don Van Vliet’s stunning paintings and drawings, live readings of his surrealist poetry, rare tracks and spoken word pieces, plus more surprises. 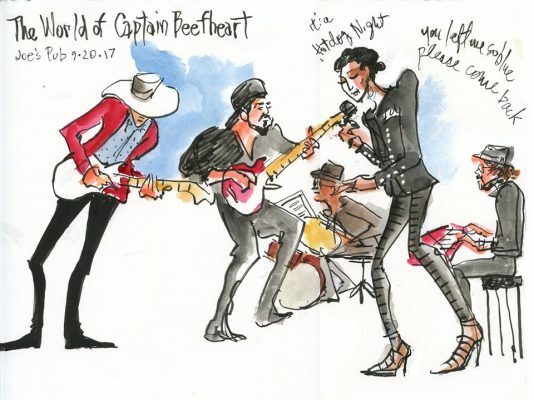 This special evening will include a performance by Lucas’ latest ensemble The World of Captain Beefheart, which includes expert Beefheart practitioners Jesse Krakow on bass, Richard Dworkin on drums, Jordan Shapiro on keyboards —with a very special guest lead vocalist to be announced! you guys need to come up to Toronto! Contact Now magazine and maybe Rex hotel and do several nights gigs! Is Nona out already or is it a scheduling issue? Odd either way.